With Cornwall conquered and Stonehenge thoroughly explored, we had returned to London. We had a rare little bit of time when the three of us, Mike, Clarence, and myself were all free for fun at the same time. It was probably me who suggested Portobello Road. Mostly because that's where the riches of ages are sold. Mike entertaining himself on the tube. It rained a little, but the street facing shop doors often led into indoor mazes of antiques and shiny baubles, so it was possible to dodge the rain for the most part. I was too busy rummaging and haggling to take too many pictures, but this documentary does a good job of explaining what the street market was like. Eating lunch at this place was probably the best part of the whole day. It was the sort of classic old timey British food that I had been searching for. The menu back there on the window is pretty funny. 1 pie & 1 mash: £2.90. 1 pie & 2 mash £3.80. 2 pie & 1 mash? £4.90. 2 pie & 2 mash: £5.80. 1 pie, 1 mash, AND peas & gravy? Settle down son. That's only available on Friday and Saturday. Peas on a Tuesday!? What are you the Prince of Persia? With the eels sold out for the day, the decision on what to order was made very simple. I had a pie and mash. There was a green sauce and a brown more gravy like sauce available for the mash. Well I got the green because it was the least familiar. Well I heard the locals calling it "liquor" when they ordered, which was I thought was interesting. Well of course I read more about it later. The story goes that London's rivers were so polluted back in the day that eels were the only fish that could survive in them, so eels became a working class staple. The "liquor" added to the dish is the water used to cook the eel with other ingredients added for flavor. Interesting. I don't recall it tasting fishy or anything. Clarence with his pie order. We woke up at our crummy motel, and to our surprise, neither of us had been raped even once! So that was good. After a couple of celebratory high fives we had to make a decision: stay in Bourbonland and see more, or take a trip to Kentucky's Creation Museum and very likely witness a life size diorama of Jesus riding a mastodon. Decisions, decisions. The museum ultimately lost due to high cost ($25 per soul) and being about 2 hours out of our way. That place is definitely still on my list though. We had picked up these cool little passports at Jim Beam's. They had a spot for a stamp from six of the area's bourbon makers. One you got all six, you could mail it in and get a free t-shirt. Challenge accepted. The six stops on the trail were Jim Beam, Wild Turkey, Heaven Hill, Maker's Mark, Woodford Reserve, and Four Roses. This map, the printable version of the passport, and additional information can be found here. 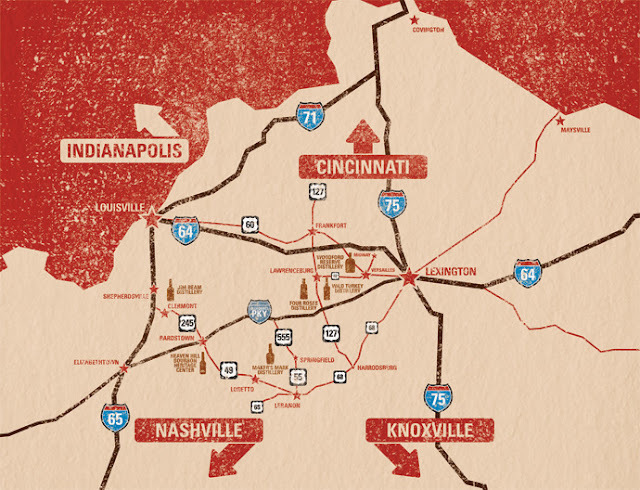 The Creation Museum is all the way up to the west of Covington. With sacred quest in hand, we hit the road. As you can see from the map, many of the locations are a bit off of the beaten track. Maker's Mark and Woodford Reserve in particular I recall were in the middle of nowhere. The countryside was a sight worth seeing in itself though. The drive was very pleasant most of the time. Heaven Hill was our first stop of the day. They had a really nice visitor center with a large museum type area. It also had the best tasting experience of all six locations. It was like a mini bourbon tasting class rather than the typical "here drink this and then get out of here" treatment we usually received. You can see on these rack houses there are black stains on towards the bottom. They mentioned the phenomena at Jim Beam's, just saying that the bourbon aging process was releasing a lot of evaporated alcohol and that it turned the surrounding trees black. Our guide said these telltale black trees were one way the feds would find hidden moonshine stills during prohibition. I had assumed that this was just some sort of a stain. Well our guide at Heaven Hill talked a bit more about it, saying that it is actually a fungus. It's called Baudoinia compniacensis, it eats ethanol, and versions of it grow on stuff everywhere from the cold whiskey stills of Canada to the cognac cellars of... Cognac. According to a really interesting Wired article on the subject, it was only just properly classified a few years ago. Here some Louisville residents are suing the local distillers for causing their cars and houses to be covered in the stuff. You might think that sort of going on the same tour multiple times would get boring, but for me it was like taking the same class from three different teachers. Each had different parts of the story to tell. By the end I felt like I had a pretty good handle on the process. I wondered how much, if any, coordination there was by the different companies to cover different facets of the experience. The rack houses are built with these x-beams in the center for stability. Our guide said the buildings are so heavy and flexible that they get hit by tornadoes with little effect. Here you can see a little string hanging down through a hole. The people that operate the warehouse use these to gauge how much the building is leaning while they add or remove barrels. This little elevator was wood on wood in order to prevent sparks. The tour ended in this barrel shaped tasting room. We smelled, swirled, tasted, added water, tasted again, and learned a ton. Here we were talking about the "legs" you seen after swirling the bourbon in its glass. The time it takes for them to fall back down tells your something about the mouthfeel of the bourbon. The third and last tour we experienced was Maker's Mark. This place was really nice. The buildings were so well kept, and the grounds so scenic, and everything was so consistently branded that the place had a theme-parky sort of feel to it. Speaking of theme-parky, I was startled when some family portraits started arguing with each other in the house where the tour begins. "Quart House. The oldest standing retail package whisky in America, circa 1889." Our guide said the building was raised so that the booze could be easily loaded onto a wagon. Maker's Mark showed a great deal of the actual distilling process, which the others did not reveal. Bourbon is basically just distilled beer. I don't think I knew that. Despite what seemed like a big health code violation, I stuck my finger in the big vat of lumpy beer goop and retrieved a big wad of it. It was not delicious. I thought it was cool how warm and bubbly it was from all of the serious fermenting going on inside. Here's a pretty cool little run through of the Maker's Mark bourbon assembly line. A Maker's Mark label says that it's "hand made", which I'm pretty sure they can claim only because the workers hand dip the bottles into the wax at the end. Another cool little tidbit was that the empty bottles come from the supplier in the same box that the full bottles will be shipped out in. You can see the empty boxes traveling in the background. The Maker's Mark gift shop was definitely the coolest. They understood that the dipping part is completely awesome, so they allow tourists to dip their own special labeled bottles. Not only that, but my understanding was the staff would dip anything purchased in the store. There were golf balls, caps, and shot glasses each with a splash of red on them. Pretty cool, but I resisted. A wax dipped necktie is one of those things that seems amazing at the time, but I would probably wonder two weeks later what the heck I was thinking. Sightseeing will do that. Lydia did a bottle for her daddy. I thought this was odd. Not only were their prices higher, but they seemed to be proud of that fact. When I asked the cashier he said something completely different, that they had a souvenir license not a liquor license. Government is an interesting force. The mom of the founder's family came up with the wax dipping, and she experimented on everything in the house. Four Roses was by far my least favorite of the six. Parking was extremely limited, forcing us to park in this odd lot that seemed to be for employees. We walked in briefly to get our stamp, and didn't get a good vibe from one of the employees doing the tours. I wasn't impressed. By this time we were concerned about having enough time to collect the rest of our stamps, so it was just as well that this place was sub-par. We did a similar fly-by of Wild Turkey. I decided we did have time for turkey-barrel riding though. The ride to Woodford Reserve was gorgeous. There were grassy hills and horses all over the place. It was pretty much a living Kentucky postcard. We made it in before close, but I think that the last tour was already over. This was the only place that charged admission to their tours, so we probably would have given this one a pass anyway. Even their rack houses were fancy stone. They looked kind of like prisons. Lydia got to try a Hot Brown in Woodford before we began the drive home. I had mine at the Brown Hotel, but I'm a pretty big deal.